My Business - "Oh God, For One More Breath"
Coal mining and railroad work were the two most dangerous trades in the United States in the early 20th century. Coal miners frequently died in spectacular explosions and cave-ins that could kill dozens or even hundreds at a time. Although most testimony about coal mining disasters came from survivors and observers, the men who suffocated to death in the Fraterville, Tennessee mines in May 1902 left behind their own grim account. 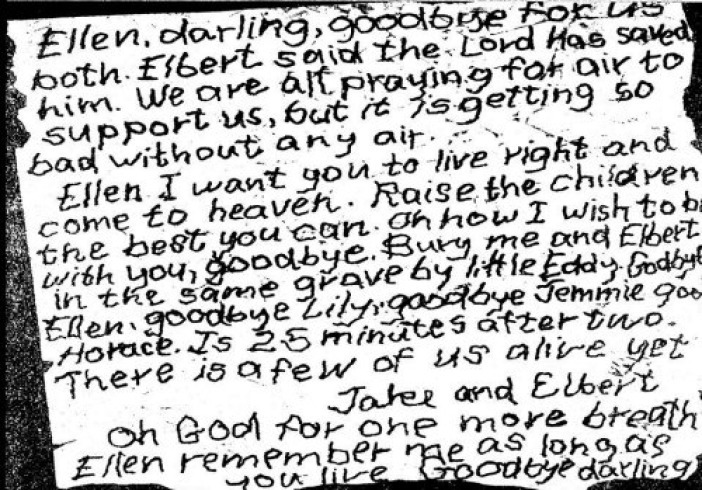 Trapped in the mine after an explosion and with their air rapidly depleting, they wrote letters to their loved ones describing their final moments. These final letters to loved ones from miners who suffocated to death after a coal mine explosion in Fraterville, Tennessee, in 1902 offer a rare glimpse of the victims' response to the dangers of working underground. To My Wife: We are up at the head of the entry with a little air; but the bad air is closing in on us fast. It is now 12 o'clock, Monday. I have to leave you in bad condition. Now, dear wife, put your trust in the Lord to help you raise my little children. Ellen, take care of my darling little Lillie. Ellen, little Elbert said that he trusts in the Lord. Charlie Wilkes said that he is safe in Heaven if he should never see the outside again. If we should never get out we are not hurt, only perished. There are but a few of us here and I don't know where the other men are. Elbert said for you to meet him in Heaven. Tell all the children to meet with us both there. My Darling Mother and Sister: I am going to Heaven. I want you all to meet me in Heaven. Tell all your friends to meet me there; and tell your friends that I have gone to heaven. Tell my friends not to worry about me as I am now in sight of heaven. Tell father to pay all I owe, and you stay there at home or at my house, and bury me at Pleasant Hill, if it suits you all. Bury me in black clothes. This is about 1:30 o'clock Monday. So good-bye dear father and mother and friends, goodbye all. Your boy and brother. From Henry Beach: Alice, do the best you can; I am going to rest. Good-bye dear little Ellen darling, good-bye for us both. Elbert said the Lord had saved him. Do the best you can with the children. We are all praying for air to support us; but it is getting so bad without any air. Howard, Elbert said for you to wear his shoes and clothing. It is now 2:30 o'clock. Powell Harmon is in Audrey Wood's hands. Ellen, I want you to live ight and come to Heaven. Raise the children the best you can. Oh, how I wish to be with you. Good-bye all of you, good-bye. Bury me and Elbert in the same grave. My little Eddie, good-bye. Ellen, good-bye. Lillie, good-bye. Jimmie, good-bye. Horace. There are a few of us alive yet. Oh, God, for one more breath. Ellen remember me as long as you live. Good-bye darling. To My Wife and Baby: My dear wife and baby, I want you to go back home and take the baby there, so good-bye. I am going to Heaven so meet me there. To Everybody: I have found the Lord. Do change your way of living. God be with you. (No name). To Geo. Hudson's Wife: If I don't see you any more, bury me in the clothing I have. I want you to meet me in heaven. Good-bye. Do as you wish. Dear Wife and Children: My time has come. I trust in Jesus. He will save. It is now ten minutes to 10 o.clock, Monday morning, and we are almost smothered. May God bless you and the children, and may we all meet in Heaven. Good-bye till we meet to part no more. To My Boys: Never work in coal mines. Henry, and you Condy, be good boys and stay with your mother and live for Jesus. to be brought out mangled corpses." The Fraterville Mine disaster on May 19, 1902, was the worst mining disaster in Tennessee history, killing 216 miners. Miners investigating a collapsed wall ignited a pocket of methane gas and caused an explosion. Debris and black smoke blasted out of the mine, and attempts at rescue using an improvised ventilation system failed to recover any survivors. Most of the miners were killed in the initial explosion, but 26 barricaded themselves into a passage and eventually suffocated hours later. Knowing there was no hope for rescue, they wrote notes to their loved ones on the walls. The town of Fraterville was devastated by the loss: all but three of the town�s men were killed. Both the ventilation furnace operator and the superintendent were charged with negligence leading to the explosion, but both were acquitted. The Fraterville mine had been widely recognized as one of the safest mines in the region before the explosion. "160 to 300 Miners Are Entombed; Mine Believed to Be Burning"
"Six Letters Written in Chamber of Death"
W. R. Queener, a Miner, is Shown in Foreground, Wearing Miner's Lamp. He Had Been at Work in Mines Thirty-Six Hours and Was Only Brought Out by Force, so Intense Was His Desire to Recover the Dead"
Fraterville and Thistle Mines are Located in the Mountain in the Background." This is the Entry Through Which the Rescuing Parties Entered and From Which Dead Bodies are Being Removed." "This picture shows the entrance to Thistle mine, out of which all bodies have been brought, and also the mine building in which the bodies were taken when brought from the mine. The men around the embankment are friends and relatives awaiting the removal of the bodies. The man whose back is marked with an X is one of the leaders of the rescue party and is now getting his men ready to go into the mine again."